Look, I’ll admit it: I never finished Fallout 4. Before you get all uppity about that, and gather to organise my lynching, know that I finished Fallout 3. Twice, in fact. Know, also that I really did try to finish Fallout 4 (sort of). And know that it wasn’t my fault that I didn’t. 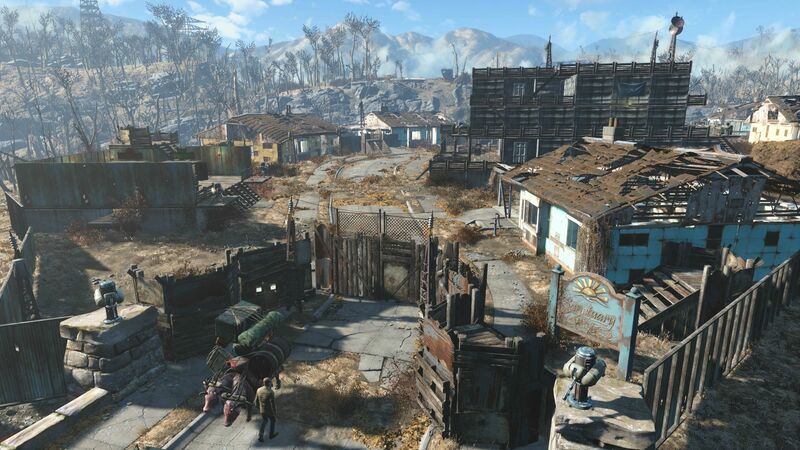 After all, how could I when there was still so much work to be done rebuilding Sanctuary Hills? Sure, the awkward, towering conglomerate of wood and corrugated metal I constructed was nowhere near as cosy as the House of Tomorrow which used to stand on this location – the one that served as my pre-apocalypse domicile – but it was the closest thing I had to a home. 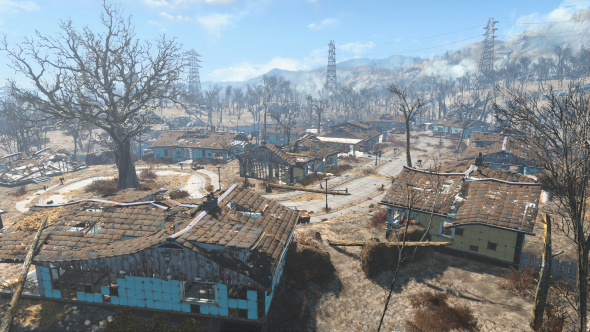 Here are some of the most creative Fallout 4 settlements produced by the community. I mean, don’t get me wrong: I was relatively concerned about my missing son and everything, and sort of mourning the wife I had spent all of five minutes living with at the start of the game, but also, y’know… what if I could electrify my base and then decorate it with christmas tree lights? Obviously, the lights and potential mayorship took precedence over any other concerns. And, as with many misguided leadership bids, it all started with the promise of a wall. I sealed off half the island, blocking invasion from the river or woods, but leaving a few ruins outside of the boundary – like feet poking out from under a well-defended duvet. Sometimes, at night, I would go and stand in one of these ruins, and drink in the sense of danger at being outside of my defensive line. Of course, so early on in the game, no real threats ever presented themselves, but the thrillwas still there. Once the wall was complete, I set about creating viewing platforms, defensive emplacements, and cosy(ish) bedrooms. Soon enough, the local resources ran dry and I became a sort of one-man ant army, establishing new routes and stripping the surroundings bare in order to fuel my spiralling ambitions. If it weren’t for this unquenchable thirst for expansion I might never have stepped beyond the borders of my little homestead. As Ben Town grew (don’t judge me, I named it early on and it just kind of stuck), the stockpiles of scrap in other parts of the world dwindled. Red Rocket Gas Station was the first to fall, of course, and then the Starlight Drive-in, and I had a pretty good go at emptying out Concord, too. Each discovery of a new location would be paired with a twinge of buyer’s remorse as I eyed up the potential building plots. But Ben Town had come too far, and promised too much, for me to expend precious resources and time on establishing a new settlement. Those third and fourth storeys won’t build themselves, after all. Of course, I wasn’t hogging all that respite from the wasteland for myself. By this point, I had a bustling little community, most of them more-or-less content – or at least only slightly miserable. As electricity became another tool at my disposal, an excess of light sources illuminated the hodgepodge silhouette of my fortress, guarded by snipers who were still yet to see any real action – and, presumably, grumbling among themselves about the fact that their mayor / town founder / glorious leader was yet to progress the main questline enough to encourage any. The automated turrets, I suspect, took a more impassive position on the whole topic. Eventually, I reached a point where I had spent so much time on Ben Town, and so little on anything else in the game, that a sense of surreal dislocation descended. You know that scene in Labyrinth, where Sarah – recently drugged – finds herself in a facsimile of her bedroom in the middle of a junkyard? For a time, everything feels normal, but when she attempts to leave, the artifice of her situation is revealed as she is ushered back inside by The Junk Lady. That is how I felt, holed up in my impenetrable fortress with no prospect of invasion or any meaningful social interactions. 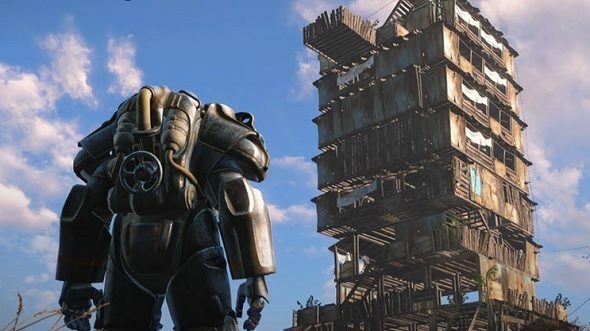 Ben Town had become a looming testament to my workshop addiction, and it was too late to set out for scripted adventures – the siren call of more recently-released games eroded my motivation to commit yet more hours to Fallout. And so it was with a heavy heart that I headed to the new climes offered by Rainbow Six Siege, Just Cause 3, and Star Wars Battlefront.